When it comes to lighting areas where color accuracy is crucial, such as portrait studios, retail stores, hospitals, medical and commercial offices, display cases, and warehouses, a high color-rendering index (CRI) is key. CRI refers to how accurately a light source reveals the true colors of objects, people, and surroundings and involves a distinct testing method with comparisons to incandescent light or daylight. The spectral graph below can be helpful in understanding the advantage of high-CRI light sources. Lights with a low CRI will show fewer colors while high-CRI lights cover more of the spectrum. A light source’s ability to show more colors increases its accuracy in revealing the true colors of people, objects, and surroundings. CRI was created by the International Commission on Illumination (CIE), a lighting standardization body, to define how accurately a light source reveals the true colors of objects, people, and surroundings. The chromaticities of eight different pastel colors are compared against one another when illuminated by a given light source and a reference light. Reference lights are chosen based on the correlated color temperature (CCT) of the light that is being tested. The reference light is a blackbody (incandescent) if the light source has a CCT of less that 5000K, and if CCT is more than 5000K, the reference light is daylight. The average differences in chromaticities are subtracted from 100 (the CRI of daylight and incandescent light), and that number is defined as the CRI of the light source. A light source with a CRI close to 100 shows colors very similarly to how its reference light shows those same colors. High-intensity discharge (HID) lights typically have a CRI rating close to zero; fluorescent lights have a range in the lower 60s and below, and LED CRIs can range from 70 to 98. Accurate color rendering can be achieved with a high-cri light strip, can light, bulb, or other high-CRI bulb or fixture. Lights with a CRI of 80 or higher are considered to show colors most accurately. 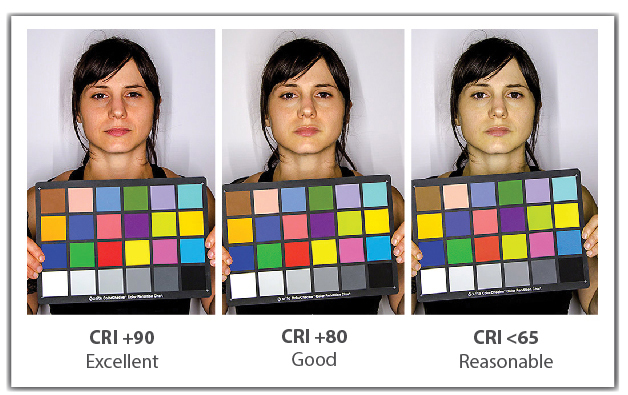 The photo below shows how different CRIs can affect colors and skin tone. Spotlights Vs. Floodlights: What’s the Difference? The CRI of any illuminant is furnished by the mfr. Is there any way to know if their ratings are independently verified? Or whether their standard measuring techniques conform to accepted practice? Not important for minor variances. But if a product really has a CRI of 70, but sold as an 88, how would a consumer know? Also, how does run time affect CRI of LEDs, if at all? Obviously, the higher the CRI, the higher the price.